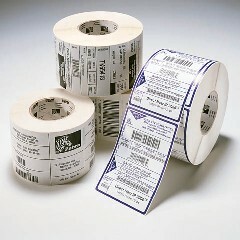 Zebra Z-Ultimate 3000T Thermal Transfer Polyestor Barcode Labels for industrial printers (3.00 Inch x 1.00 Inch; 5240 Labels/Roll, 4 Rolls/Case). Gap Sensing. UL/cUL indoor/outdoor and CSA indoor/outdoor recognition when paired with Zebra's 5095 and 5100 resin ribbon.